This one's near and dear to my heart folks! Barbie likes to spend time in the kitchen too... So let's whip up a super simple 5 Minute Chef's Hat and Apron! I've had a little ruffle remnant for years, it's about 2 1/2" wide and was perfect for this quick project! The neat thing about this ruffle is, it really doesn't fray. It also comes in other colors so that could be fun too. I decided to use velcro instead of ties for the apron. Lovin' the cute top of the hat! Cut a piece of ruffle 5" long. Putting the right sides of the material together, sew a 1/4" seam along the cut edges, back stitching both ends. While still inside out, run a hand sewn gathering stitch (about every 1/4") along the very top of the hat (actually the bottom of the ruffle). Gather and tie a knot. Turn hat to the right side and "puff" it out-done! About 1" from each edge, cut the ruffle fabric up to the waistband, but don't cut the waistband. Then carefully trim off that fabric so it looks like an apron instead of a skirt. Sew a piece of velcro to each side of the waistband for closure-done! Option: You could sew a ribbon into the waist band if you'd like a tie closure. Now Barbie's ready to do some holiday baking! This hat and apron are my ideas for a quick, fun project to do with your daughter or granddaughter. 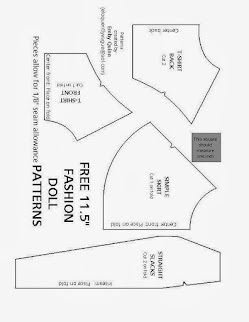 There are many more styles on-line and there's a great tutorial HERE to use any fabric you'd like .